In my book, Disney’s Animal Kingdom: An Unofficial History, I devoted an entire chapter to detailing many of the extracurricular activities available to Disney’s Animal Kingdom and Animal Kingdom Lodge guests, things like the Wild Africa Trek and the Sunrise Safari. Any future revisions to the book will surely include a segment on Caring for Giants, a behind-the-scenes look at the magnificent pachyderms who roam freely in the park’s vast savanna. 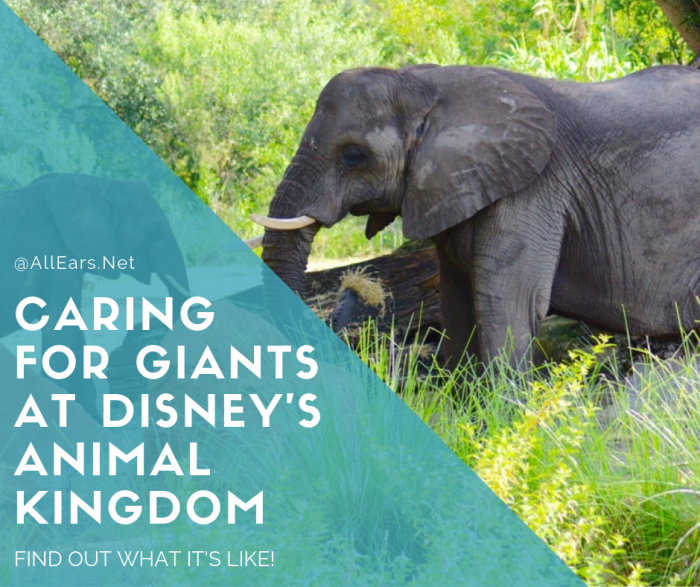 Caring for Giants is an hour-long experience that is exclusive to Animal Kingdom. After purchasing your ticket ($30 for both adults and children, with Disney Vacation Club and annual pass holder discounts available) and signing waivers at a booth near the entrance to Kilimanjaro Safaris, you’re given a lanyard with a name tag. That name tag, you’ll learn at the tour’s conclusion, is made from an interesting component: Elephant dung. That’s one of the dozens of things you’ll learn during this educational and quite enjoyable sojourn. The adventure begins when your group walks out of the park and into a backstage area. Along the way, you’ll pass a back door to the Festival of the Lion King venue. If you’re lucky – and we were – you’ll see and interact with several of the show’s stilt walkers as they make their way to the building’s back entrance. In our case, the colorfully clad performers stopped to chat with some of the younger members of the group, including our granddaughter Abigail. From here, you make your way to a backstage parking lot, where an air-conditioned bus – parked near several of the rugged vehicles used for Kilimanjaro Safaris – awaits. The bus motored past a variety of behind-the-scenes areas: Storage facilities, animal care centers and fields where the animals’ food is grown. After crossing over the Wildlife Express Train tracks, our bus finally came to a gate in a rather remote-looking section of the park. The gate swung open and we proceeded along a dirt road bordered by a small stream. The bus came to a stop about a quarter of a mile down the road. Here, we disembarked the bus, then climbed up an aluminum staircase and arrived at our destination: A shaded overlook area, where we were greeted by elephant experts. A few yards in the distance were several elephants… who were fast asleep. The overlook area is fenced in and is surrounded by tall trees that provide ample shade; there are benches available. 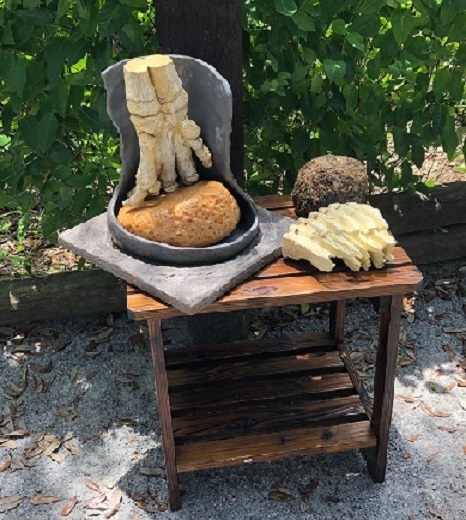 Near the fence is a display that showed a cross-section of an elephant’s complex hoof. 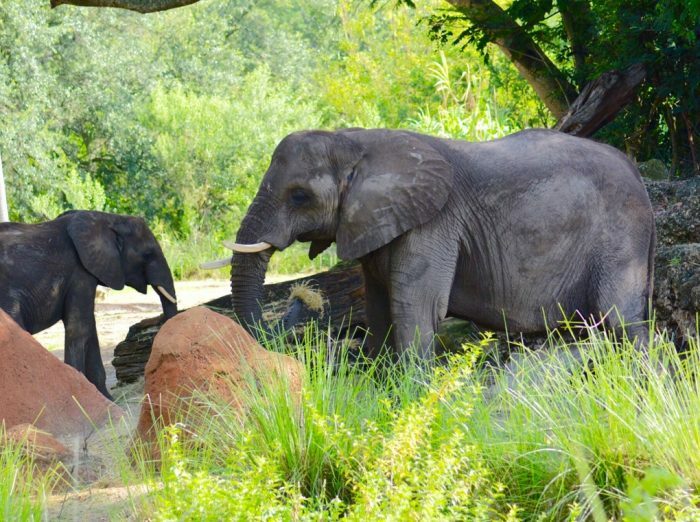 As we observed the elephants – six or seven were visible standing near a tall baobab tree – several vehicles from the Kilimanjaro Safaris attraction could be seen as they rumbled by. One of our guides pointed out several of the elephants by name, including Rafiki, an elderly female who has never had any offspring, as well as one of Animal Kingdom’s newest stars, Stella, who was born on Dec. 14, 2016, to Donna. Stella weighed 240 pounds at birth and will be on her mom’s milk, we were told, until she’s about 3 years old and can completely rely on her trunk to feed herself. 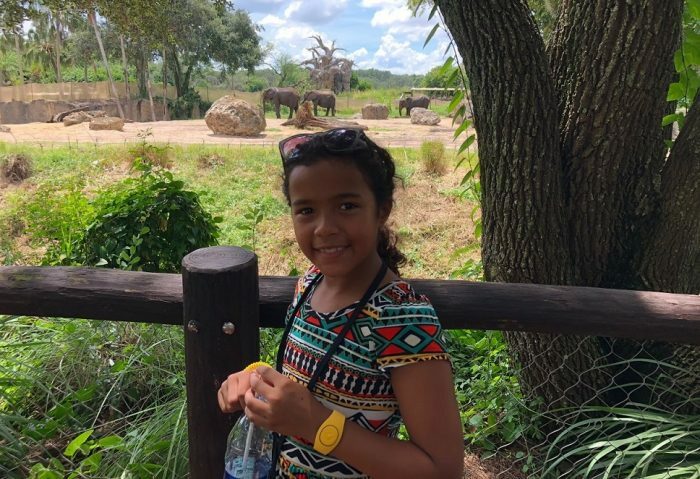 We learned other important facts about elephants — how they tend to live in family groups, and how members of the group communicate, primarily by touch, smell, sight and sound. Elephants can live up to 70 years, and when a member of their group passes away, the other members show genuine sorrow and empathy. The elephants are given top-notch care by the park’s veterinarians. “Blood samples are taken once a week, from their ears,” a guide said, to make sure they’re healthy. The experts also talked about elephants’ uncanny ability to find water, particularly in arid areas. “They can sense water underground,” we were told, so when humans are searching for water sources, they’ll bring an elephant along to find pools of water underfoot. And whatever’s left over can be used to make paper. 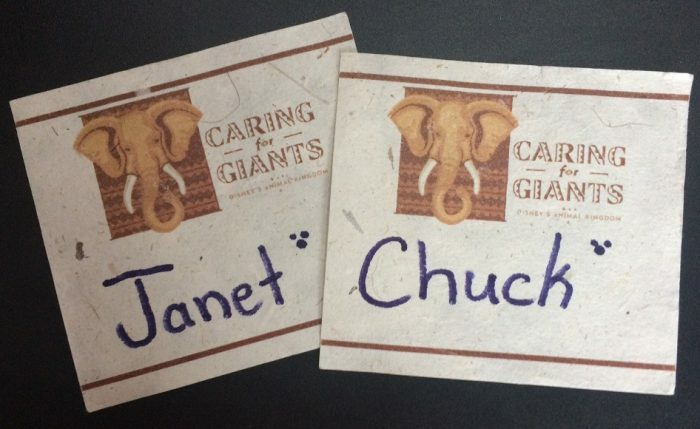 Have you experienced the Caring for Giants program at Disney’s Animal Kingdom? Share your thoughts on this program and read about others’ experiences in our Rate and Review section! You can read about and rate other tours here, as well. Subscribe to the AllEars® Newsletter and get our FREE download! We experienced this tour last Christmas Day and loved it. Such a great and reasonably cost tour to experience back stage and learn about these amazing gentle giants. I highly recommend.